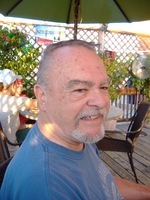 Dave Huber, of Prairie Grove, passed away in Fayetteville, Arkansas Saturday evening, September 2nd. He was born and raised in Chambersburg, Pennsylvania. He moved to Little Rock, Arkansas after leaving the Air Force and marrying Patricia Howard of Chambersburg. A true friend to all who met him, Dave worked in helping, creative, and innovative professions including: speech pathology and audiology, helping the mentally impaired adjust and reintegrate into society, woodworking and restoration - with work displayed in the Smithsonian Institute, marketing manager for Hancock Fabric, aquaponics entrepreneur, videography, various small business enterprises, and a Nuclear Weapons Specialist with the U. S. Air Force/Strategic Air Command. He is preceded in death by his parents; Lester Crawford Huber Sr, and Rhoda Stepler Huber of Chambersburg, his brother L. C. “Sonny” Huber, of Fayetteville, PA, his wife Patricia Howard Huber (later of Sherwood, AR). He leaves behind his sister: Saundra Hemperly, three children and their spouses: Eric Huber and Christi Daniels, Matt Huber and Aimee Huber, and Amanda Shertzer and Rob Shertzer, ten grandchildren: Hailey O’Conner, Brett Pitts, Avery Pitts, Logan Huber, Justyne Huber, Havyn Huber, Benjamin Shertzer, Jack Shertzer, Emma Shertzer, and Devon James, and two great-grandchildren: Denae and Seth O’Conner, a stepson: David Craig, nephews and nieces: Jeff Hemperly, Randy Hemperly, Terri Newberry, Greg Huber, Mark Huber, Kara Howard, Alison Howard, and Ashlee Howard Fleming. Funeral services will be held at the National Cemetery in Fayetteville, AR at 2:00 pm, September 22nd. A memorial gathering will be held immediately following at the Prairie Grove Christian Church in the Quest building. To send flowers to the family of David Earle Huber, please visit our Heartfelt Sympathies Store.